Mood Indigo also known as Mood I or MI, the annual cultural festival of the Indian Institute of Technology Bombay has grown into the being Asia’s largest and most anticipated festival. The festival has always played a host to the some of the best international and Indian artists. One of the must sought out events of MI is the EDMnite. 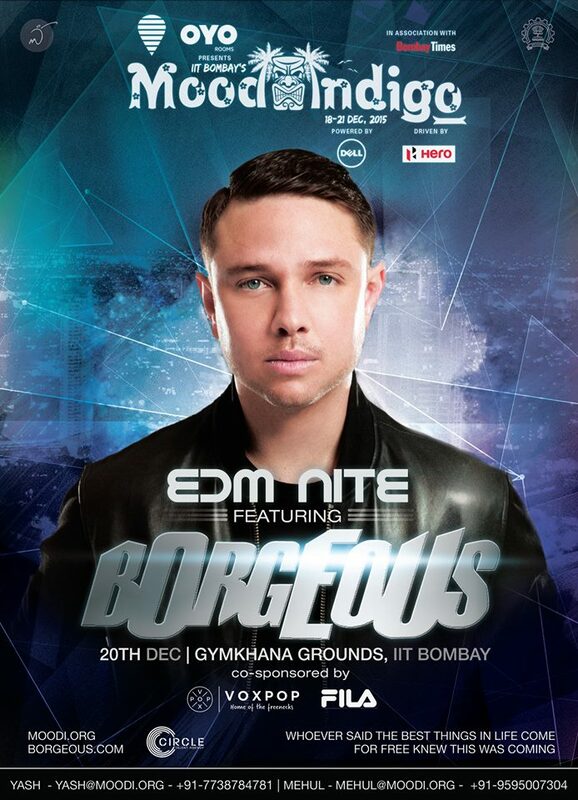 The MoodI team recently revealed that the event will be headlined by the amazing Miami born DJ Borgeous. Borgeous has been making waves as a DJ and music producer. For those who may be unfamiliar with Borgeous, he’s the producer who worked with Canadian duo DVBBS in 2013 to release one of the biggest electronic tracks of 2014, Tsunami. With hits like ‘Tsunami’ and collaborations with record labels like DOORN and Spinnin’, he’s showing no signs of stopping. Still riding high on the motivation he’s gained from his string of massive electro club hits, he has been touring the world and creating an ever growing fan base. Borgeous has carved his original style which he likes to describe as ‘Diverse’. With a plethora of successful tracks, this is the artist that no EDM lover should miss. Every year IIT-B tries to make MoodI a bigger and better experience and with this announcement they have surely upped their game. For more details on Mood I check out their official webpage and for the latest EDM news follow us on Facebook and Twitter.